1. Descriptive of something which is made, done, or acted on very quickly or too fast without enough thinking or planning: Jim and Jane made a precipitate decision to go on a trip before they had prepared the details necessary to make such a commitment. 2. 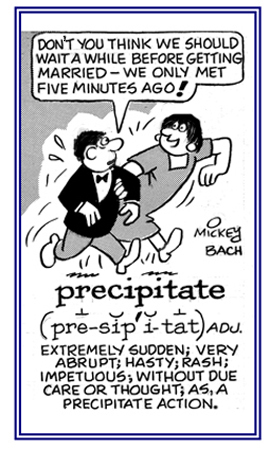 Referring to a situation or event occurring with haste or speed: Linda had to make more precipitate choices for the rest of her final exam at school because there was only five minutes more to complete it. 3. Etymology: from Latin praecipitatus, "hurl headlong, fall, be hasty" from praeceps, "headlong"; prae-, "forth, before" + caput, "head". © ALL rights are reserved. 1. To send someone or something suddenly and rapidly into a particular state or condition. 2. To cause a liquid or solid forms of water, condensed in the atmosphere, to fall to the ground as rain, snow, or hail, or fall in such a form. 3. To throw someone or something from a great height, or to fall from a great height. 4. To cause a substance in solution to settle down in solid particles; the solid that settles out of a solution. 5. A deposit made or substance thrown down. 6. Occurring with undue rapidity: The steep rise in prices for gas precipitated street rioting. 7. In immunology, the product of interaction between soluble macromolecular antigen and the homologous antibody; that is, the antigen-antibody complex formed as a consequence of the reaction of pneumococcus capsular polysaccharide in solution with specific antiserum. 8. Etymology: from Latin praeceps, praecipitis, "headlong, steep"; from prae-, "before, forth" + caput, "head". 1. The act of making something happen suddenly and quickly. 2. A casting down or falling headlong. 3. A hastening or hurrying in movement, procedure, or action. 5. Unwise or rash rapidity. 6. In meteorology, falling products of condensation in the atmosphere; such as, rain, snow, or hail: "When the weather forecast predicts a high precipitation level, people should expect a lot of rain or snow." 7. The amount of rain, snow, hail, etc., that has fallen at a given place within a given period, usually expressed in inches or centimeters of water. 8. In chemistry and physics: the precipitating of a substance from a solution. 9. Etymology: "sudden haste", from Middle French precipitation (15th century); directly from Latin praecipitationem, praecipitatio, "act" or "fact of falling headlong, haste, steep place"; from praecipitare, "to throw headlong, to fall, to be hasty"; from praeceps "headlong, steep"; which was a compound formed from the prefix prae-, "in front" + capit, caput, "head". 1. A reference to an action done or acted on too quickly and without enough thought: Monroe finished his company assignment in a precipitous way which was accomplished in great haste and without proper deliberation. 2. Etymology: "abrupt, hasty"; later, "rushing headlong; probably formed partly in English from Latin praecipitium, "precipice" meaning "steep, headlong, headfirst"+ English -ous, "characterized by". © ALL rights are reserved. 1. Abruptly; in a precipitous manner; with a steep descent: The mountains rose precipitously from the shore of the ocean. 2. Very suddenly and to a great degree: If a reduction or increase is precipitous, it is fast. 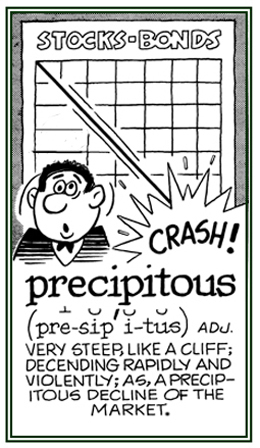 The characteristics of a slope that is very steep: Examples of precipitousness include: quick, sharp; short, hurried, hasty, blunt; discontinuous, broken, and uneven. Presenting a short summary of the main points and ideas of a composition: Adam is a skilled accountant who précises accurate summaries of his company's financial earnings. 1. Relating to something which is exact and accurate, or detailed and specific: Theodor, the university professor, always strives to present precise lessons so his students will understand what he is talking about. 2. A reference to someone who is very careful about small details; concerning something which is proper, correct, and faultless: Tim's mother is teaching him precise examples of correct behavior. 3. Denoting that something is the exact one that is being referred to: At that precise moment, it started to thunder and rain just as the weather forecaster had indicated on TV. 4. Descriptive of something that is distinct and correct; such as, a talk or discussion: Henry is a very precise speaker when he is presenting the procedures that are necessary for a profitable income for his company to his fellow employees. 5. 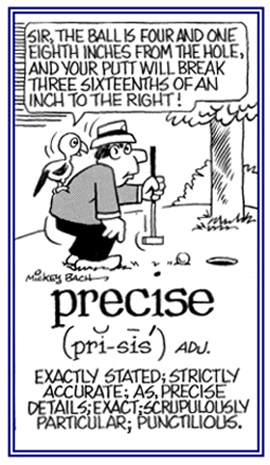 Etymology: from Latin praecis-, "cut short"; from prae-, "in advance" + caedere, "to cut." © ALL rights are reserved. 1. Used to indicate that something is stated exactly: Ted said this is precisely what I mean when I say that inferior equipment was the reason some of the hikers refused to continue the climb up the mountain. 2. With absolute accuracy: Instruments must be adjusted precisely before they can be used. 3. In complete and accurate detail: Tell me precisely what happened when the thunder storm came last night. 4. Clearly and distinctly: Shirley always speaks very precisely when she is teaching her students about writing their compositions. 5. Used to add emphasis when specifying something: It was precisely because you didn't tell Ingrid that you needed her help that she didn't come to work with you. 6. Used to indicate complete agreement with what has been said: Kay is precisely correct when she says that the repairmen can't be relied on to finish the job on time. 1. Clarity as a consequence of exactness. 2. The quality of being reproducible in an amount or performance: Sam handled it with the preciseness of an expert as shown by accuracy of his work. 1. The quality of being sharply or exactly defined; for example, a measurement with three significant figures is more exact than a measurement with two; a degree of accuracy. 2. In statistics, the extent to which a measurement procedure gives the same results when repeated under identical conditions. 3. Someone who is concerned about correct rules and behavior; especially, in moral and religious matters. 4. Someone who is strict in the adherence to established rules, forms, or standards. A person who attaches great or too great importance to being exact. 1. Someone who insists on or strives for absolute quality. 2. Someone who a purist. 1. A concise or an abridged statement or view: Monroe presented a précis of his book's plot to the audience. 2. 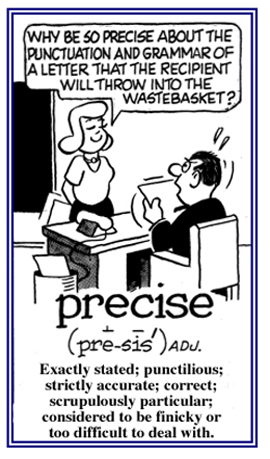 Etymology: from prae, "before" and caedere, "to cut". Showing page 4 out of 19 pages of 275 main-word entries or main-word-entry groups.